The first glimpse you take of the Taj Mahal is akin to peeking around the corner back into a time long forgotten. Just look at that architecture. Walking up to it, you’re immediately confronted by minarets, spires, and layers of sandstone and marble. A little closer, and Arabic script from the Koran shifts from fuzziness into view. On a macro level, it literally shines. The bright trim around each of the stone flower inlays of the interior can take your breath away. We arrived at the Taj with the early-morning crowd (6:30 a.m.!) and made our way into the garden, past the lines for security. Our guide noted the (relative) lack of pollution around the area, due in part to a government order that the white finish of the Taj be undisturbed. 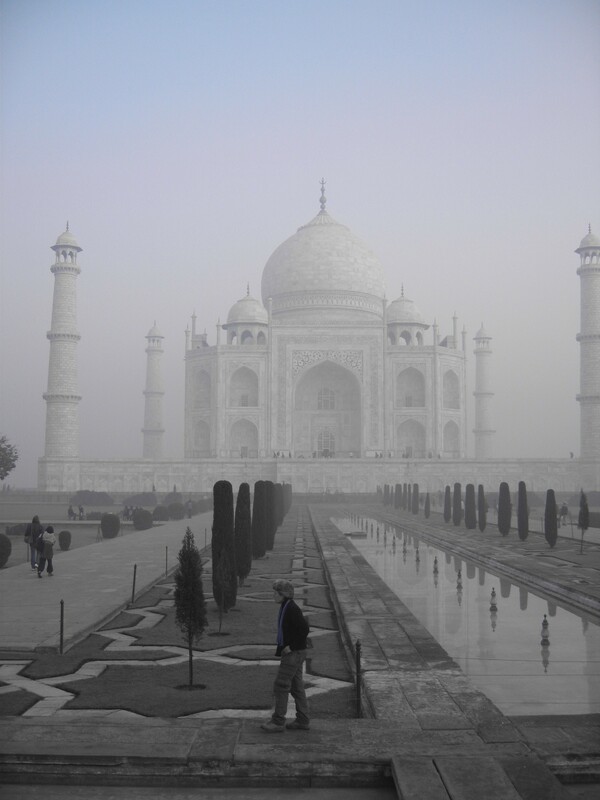 The mist from the Yamuna River, which sits behind the Taj Mahal, however, helped to provide an aura of mystery around the building. Hyperbole aside, the Taj Mahal is a sight to behold. Efforts to preserve the monument, which has a long backstory as a tomb for the fourth wife of King Akbar, have kept the grounds pristine and the finishings ornate. The price of entry is a little steep (750 Rs / $17), but the Indian government throws in a water bottle and shoe booties for foreigners. Try getting that for free at an American historical site. Check out the galleries below to see just how much fun we had at the Taj Mahal. Our next stops along the way are a bird sanctuary in Bharatpur and the palace that is Fatehpur Sikri. Check back soon for updates! Gallery | This entry was posted in Chalega. Bookmark the permalink.